Quantum Computation and Quantum Information (QIP) deals with the identification and use of quantum resources for information processing. This includes three main branches of investigation: quantum algorithm design, quantum simulation and quantum communication, including quantum cryptography. Along the past few years, QIP has become one of the most active area of research in both, theoretical and experimental physics, attracting students and researchers fascinated, not only by the potential practical applications of quantum computers, but also by the possibility of studying fundamental physics at the deepest level of quantum phenomena. 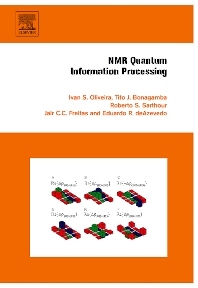 NMR Quantum Computation and Quantum Information Processing describes the fundamentals of NMR QIP, and the main developments which can lead to a large-scale quantum processor. The text starts with a general chapter on the interesting topic of the physics of computation. The very first ideas which sparkled the development of QIP came from basic considerations of the physical processes underlying computational actions. In Chapter 2 it is made an introduction to NMR, including the hardware and other experimental aspects of the technique. In Chapter 3 we revise the fundamentals of Quantum Computation and Quantum Information. The chapter is very much based on the extraordinary book of Michael A. Nielsen and Isaac L. Chuang, with an upgrade containing some of the latest developments, such as QIP in phase space, and telecloning. Chapter 4 describes how NMR generates quantum logic gates from radiofrequency pulses, upon which quantum protocols are built. It also describes the important technique of Quantum State Tomography for both, quadrupole and spin 1/2 nuclei. Chapter 5 describes some of the main experiments of quantum algorithm implementation by NMR, quantum simulation and QIP in phase space. The important issue of entanglement in NMR QIP experiments is discussed in Chapter 6. This has been a particularly exciting topic in the literature. The chapter contains a discussion on the theoretical aspects of NMR entanglement, as well as some of the main experiments where this phenomenon is reported. Finally, Chapter 7 is an attempt to address the future of NMR QIP, based in very recent developments in nanofabrication and single-spin detection experiments. Each chapter is followed by a number of problems and solutions. For senior undergraduate students and graduates. It can also be used as a reference book in advanced quantum mechanics courses and will be useful as a reference for research in the area of QIP, and other correlated areas. 7.4 NMR on a chip: towards the NMR quantum chip integration.